Covering Dixie Like Mildew: Johnny Manziel, Jeff Driskel, Aaron Murray, and more. Covering Dixie Like Mildew - The SEC. You're soaking in it. Obligatory Johnny Manziel item of the day. Good Bull Hunting interviews ESPN: The Magazine's Wright Thompson about his article on Texas A&M starting quarterback Johnny Manziel and his family. Least. Shocking. News. Ever. Of the day. For Whom the Cowbell Tolls wonders if Mississippi State will finally get the monkey off its back and beat LSU in 2013. Johnny Manziel being compared to Matthew Stafford is never a good thing. The worst thing ever to happen to Texas A&M starting quarterback Johnny Manziel has happened. No, not the Wright Thompson article for ESPN. It's being compared to former Georgia and current Detroit Lion QB Matthew Stafford by FOX Sports' Jack Kuhlenschmidt. "Not so fast. Let's take a minute to gain some much-needed perspective on all of the recent Johnny Manziel drama. This kid isn't the first All-American to be seen at a party, and the world didn't end when this sort of thing happened before. Remember Matthew Stafford? You should, seeing as he is the starting quarterback for the Detroit Lions. He also won three bowl games during his time at the University of Georgia on his way to being selected first overall in the 2009 NFL Draft. Oh yeah, and Staff also loves to party. His penchant for red solo cups definitely didn't hold him back in college." Does Johnny Manziel really need to be compared to a Georgia QB who managed to become a first pick in the draft while still managing to underperform in college? Or has gone on to underperform in the NFL? Or manages to be the fattest-looking 232 QB in the NFL? Didn't think so either. Of course, it could be worse. Manziel could be compared to Heisman winner and NFL washout Matt Leinart...oh wait, that did happen! A few thoughts on the Wright Thompson's Johnny Manziel article. You may already be aware of Wright Thompson's ESPN article on Texas A&M starting quarterback Johnny Manziel. If not you seriously need to check it out. Started from the bottom...no he didn't. One of the first things Thompson deals with in the article that most stories on Manziel never seem to get into is his family's wealth. Talk of the family's background never came into play until after Manziel appeared on TNT sitting the front row at a Houston Rockets game, prompting Steve Kerr's infamous comments about JFF's NCAA eligibility. I've never been able to find an exact figure on how wealthy the Manziels are, but in the article, Johnny's father, Paul Manziel, comments that while it's substantial, "It's not Garth Brooks money." (Brooks is reportedly worth around $150 million). The fact that Manziel came from a wealthy background shows how radically different he is from many college athletes who came from a lower-to-middle-class background. If it wasn't for football, Manziel's antics on the would probably be another anonymous rich fratboy waiting college out for when he could take a corner office in his family's company. You have to feel for Johnny Manziel's parents. Manziel's mother bemoans the fact that Johnny goes to Drake on how to handle his celebrity instead of her. His dad sees a lot of his younger self. His annoyance at dealing with NCAA compliance and the fact that other people are reaping the financial benefits of his son's gridiron success comes off more as more the outrage of an Ayn Rand devotee over taxes than a father waiting to cash in on his son's talents. Both seem frustrated over their inability to to help Johnny through the whirlwind he's living in. I was of a feeling it was out of control. No one was prepared for Johnny Football, not the Manziels, not Texas A&M, not Johnny Himself. The best thing to happen to Manziel off the field last season may have been Kevin Sumlin's policy of denying media access to freshman players. It kept the reporters away from Manziel, and gave him some breathing room for a few months. On the other hand, it helped turn Johnny Football into a bigger-than-life figure, quickly overshadowing the real Jonathan Paul Manziel. Thompson's article paints Johnny Manziel and his family as being trapped in a situation they weren't prepared for. The biggest threat to Manziel's ability to control the whirlwind around him is a support system that no matter how well-intended, was as inadequate to handle Johnny Football as the levees of New Orleans were able to deal with Hurricane Katrina. Hopefully, there's still a chance to weather the storm. SEC media gadfly in exile Paul FInebaum may know his college football, but as this reply to al.com's Matt Scalici shows, his knowledge of the pros is rather limited. Or at least somewhat out-of-date. Uh, the NFL Central ceased to exist when the NFL and AFL merged, Paul. It evolved the NFC Central afterward. The NFC Central went the way of the Canton Bulldogs when the NFL went to four divisions per conference back in 2002. But thanks for the attempt at humor anyway, PAWL. I've got to think Bama would have some serious problems dealing with New Orleans and Atlanta (hi, Julio Jones!) 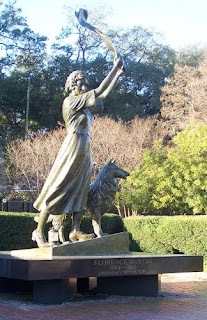 , and probably Carolina (hi, Cam Newton!) as well. Covering Dixie: Jonhhy Manziel, Aaron Murray, and more. Covering Dixie Like Mildew - The SEC. Need we say more. Obligatory Johnny Manziel-related item of the day. I've seen the future and it will be. CBS Sports' bloggers and staff make their predictions on the SEC East and West. Georgia, South Carolina, and Florida split the votes for who will win the SEC East, while all but Dennis Dodd pick Alabama to win the SEC West. (Dodd picks Texas A&M). These three things I are know are true. Just what was Johnny Manziel doing in Austin, Tx. this weekend anyway? Johnny Manziel in a Tebow jersey, Deal with it. Via Deadspin. 10.Black Sabbath was in Austin on Saturday night. Nuff said. 9. The University of Texas hasn't had a Heisman Trophy winner since Ricky Williams won in 1998. Johnny figured it was time Austin remembered what one looked like. 8. Hanging out with Texas governor and former Texas A&M male cheerleader Yell Leader Rick Perry. 7. Johnny set off to Waco to hang out with Baylor head football coach and fellow Drake fan Art Briles, but took a wrong turn. So he went to the frat party on Friday night to get directions. Got invited to come to the other party on the way back to College Station. 6. Searching out locations for his future "Johnny Manziel's Taco Hole" franchise. 5. Johnny has aardvarked all the sorority sisters at Texas A&M (to use one of Joe Bob Briggs' euphemisms), so he needed to find a new batch. 4. Dehydrating. What do think Johnny Manziel was doing in Austin? 3. Making a pilgrimage to The Real World: Austin house to honor boyhood idol (and long time The Challenge douchebag, Wes Bergman. 2. Austin has two Waffle Houses. College Station has zero. Seriously, this is an issue. 1. He's Johnny Fraking Football . He can do exactly whatever the frak he wants. Johnny Manziel won Twitter (and the Internet) today. You can all go home now. Johnny Manziel's Life is Just Better Than Yours. Johnny Manziel with his new friends in Austin. Via: Deadspin. Johnny Manziel decided to finish his latest blowing up of the Internet this weekend by making his critics on Twitter his you-know-what Sunday afternoon. After a Saturday where he made a couple of University of Texas frat parties more famous than a Longhorn could, Manziel decided to go after a few well-known haters and a general troll or two look stupid. First up. Yahoo! Sports Pat Forde, who foolishly decided to reply to a Manziel tweet. The Sporting News' Matt Hayes also decided to test JFF's wrath. Next, is Twitter's Joe Dunne, who is neither artist Joe Dunne nor the Irish manager of Colchester United. He is, however, an Oklahoma fan, which for our purposes is all that matters here. And finally, a Mr. Colin Ratz, who goes by the rather uncomfortable twitter handle @RatzinmyPantz. Sadly for Mr. Ratz, his attempt to troll got totally troll-blocked by Manziel's friend, Mr. Heisman. Yep, Johnny Football still has scoreboard. Just consider the internet won for the day, chill out and hand out with the fams or something. Hi there. Taking a mental health day today. Also know as hanging out with friends for my birthday. Make sure you're back tomorrow. The Fallout: Kolton Houston, Rushel Shell, Jadeveon Clowney, and more. Welcome to the Fallout - Is it August 31 yet? The say the Sun is sometimes eclipsed by the Moon. Obscure Art Briles factoid of the day. Black Heart Gold Pants analyzes Iowa HC Kirk Ferentz' Big Ten Media Days media session. The hiring of Curley Hallman to be LSU HC in 1991 is named by And the Valley Shook as the "biggest disaster in LSU history." And you thought Aggies were weird. The Fallout: Kolton Houston, Jadevon Clowney, Johnny Manziel, and more. Welcome to the Fallout - Friday edition. 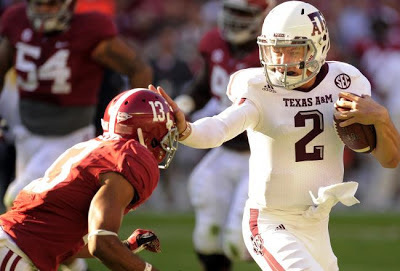 The Gainesville Sun names Texas A&M Starting Quarterback Johnny Manziel the SEC's top player. Hot Seat? What Hot Seat? Adam Gold names Georgia Tech HC Paul Johnson the top coach in the ACC. Rocky Top Talk names former Tennessee HC Derek Dooley's hire as one of the "Biggest Disasters in SEC History." 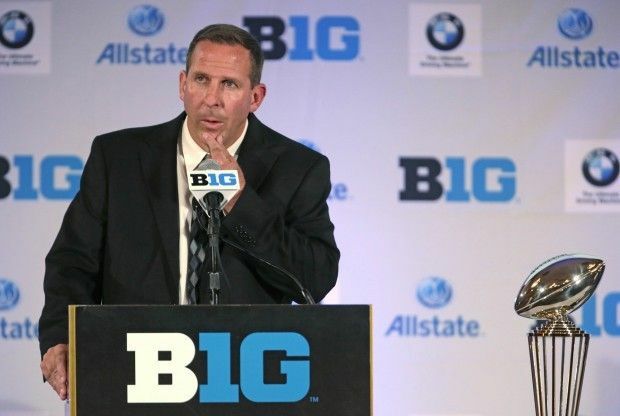 Nebraska head football coach Bo Pelini decided to make one of those inexplicable comments about the SEC hat could only come from a Big Ten coach who secretly wishes he was an SEC coach. Bo Pelini: "The whole SEC isn't Alabama. There are a lot of teams in the SEC that would like to be Nebraska." Really, this comment is full of Freudian reverse psychoanalysis that shouts "I am so jealous that Bret Bielema found a way to escape from the Big Ten Matrix and went down the rabbit hole to Arkansas and the SEC. Please, Morpheus Slive, give me one of your red pills." But just for argument's sake, if Pelini right about SEC teams wanting to be Nebraska? There must be one, right? Alabama - The Crimson Tide has 86 15 national titles. Nebraska has three. 'Nuff said. Georgia - Who beat Nebraska in the Capital One Bowl this past New Years Day? Thought so. On the other hand, Bulldog HC Mark Richt is from Nebraska grew up as a Husker fan, thus should be probably the first name on the list when Pelini is fired at the end of the season if and when that happens. I'm not holding by breath that Richt bolts for Lincoln, though. Tennessee - Would still probably have done better than Nebraska did against Miami in the 2001 BCS title game. Arkansas - Joined the SEC when Nebraska and the rest of the old Southwest Conference joined the Big 12. That pretty much blows the idea of wanting to be Nebraska out of the water. 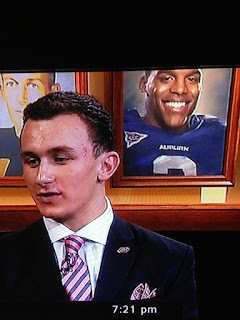 Texas A&M - Johnny Manziel > Taylor Martinez. Next. Mississippi State - Let's see...Mississippi St. was beaten by Northwestern in the Gator Bowl, who was beaten by Nebraska in the regular season...nah, even that one's a stretch. Missouri - Probably had enough of Nebraska in the Big 12. Florida - Lost to Nebraska in the 1996 Fiesta Bowl, and lost the national title with it. Would still not trade two BCS titles in the Aughts to be Nebraska. Also, Nebraska has a history of criminal behavior among players that overshadows the Gators even with Aaron Hernandez. South Carolina - Would you rather have Pelini or Steve Spurrier as you HC? Thought so. LSU - Tiger Stadium vs. Memorial Stadium? Death Valley wins. Kentucky - Nebraska has basketball? Ole Miss - Would reject to being Nebraska for the Archie and Eli Manning connection. Vanderbilt - Probably should, but the SEC has the better TV deal. Big Ten mascots get together to haunt your dreams forever. What's worse that one Big Ten furry mascot haunting your dreams? How about nine? 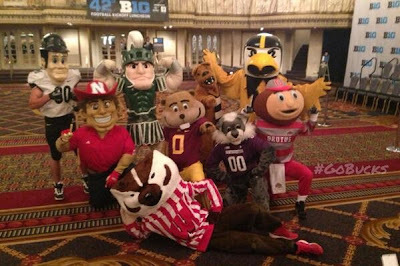 Bucky Badger, Brutus Buckeye, and the rest of the B1G's Freudian nightmare-inducing cosplayers got together for a group photo at Big Ten Media Days guaranteed to scar you for life. Just remember when you get on your knees to pray tonight to thank God that Michigan, Indiana, and Illinois have mercifully not joined in on the furry brigade. If this isn't bad enough, get a load of the GIF version. Goldie Gopher's head is spinning around like a record, baby. I'm never going to sleep again. Never. Covering Dixie: Jadeveon Clowney, Johnny Manziel, A.J. McCarron, and more. Covering Dixie Like Mildew - The SEC. It's like Christmas, but with more...football. Robbie Andrew profiles Clowney for The Gainesville Sun. And the Valley Shook complains about LSU's "tough" 2013 schedule. I'm shocked. SHOCKED, I tell you! Good Bull Hunting held a contest for best drawing of a Texas A&M coach or athlete. The winners are well, interesting to say the least. South Carolina football's equipment staff, like many equipment staffs around the country, has it's own Twitter account. Thursday morning it tweeted out this image featuring a conspicuously shiny Gamecock helmet. It would seem that the Gamecocks are joining the growing number of college football teams that have added an alternate chrome helmet to their uniform combinations. Don't worry about making the "chrome visor" for SCAR head football coach Steve Spurrier joke, because somebody else already has. Covering Dixie: Antonio Morrison, Johnny Manziel, Mark Richt, and more. Covering Dixie Like Mildew - The SEC. Deal with it. I ain't the sharpest tool in the shed. Alabama head football coach Nick Saban is smart. Because Roll 'Bama Roll said so.They might be a little biased, for some reason. One, two, three, four, five against one. Track 'Em Tigers names "Five Auburn players poised for a breakout year on offense." This includes starting quarterback Nick Marshall and running back Cameron Artis-Payne. Mark Richt's annual high-dive in jeopardy due to hip replacement surgery. Mark Richt going off the deep end. 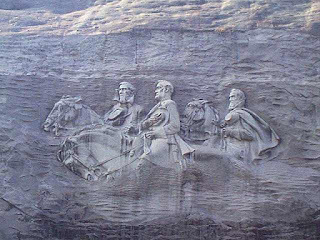 One of Georgia's cherished traditions may be in danger of coming to an end. Bulldog head football coach Mark Richt says that the hip replacement surgery he underwent in February may cause him to skip out on his annual high dive backflip at the team's pool party. "I'm trying to get my nerve up," according to Richt. "But I don't know how wise it would be to do that right now. I thought by now I'd be a little farther along as far as the confidence level to do something like that, but if you land wrong at all, and your legs spread a little bit in the process, it could be bad. Right now if you ask me, I'd predict that I won't do it. Maybe I'll go off the 3-meter, but the 10-meter, I'm not sure I'm ready for that." Richt claimed last year that his need for hip replacement surgery was due to an unfortunate accident involving a swing-set swing when he was trying to impress his wife Katheryn about twenty-five years earlier. Isn't that always the story? 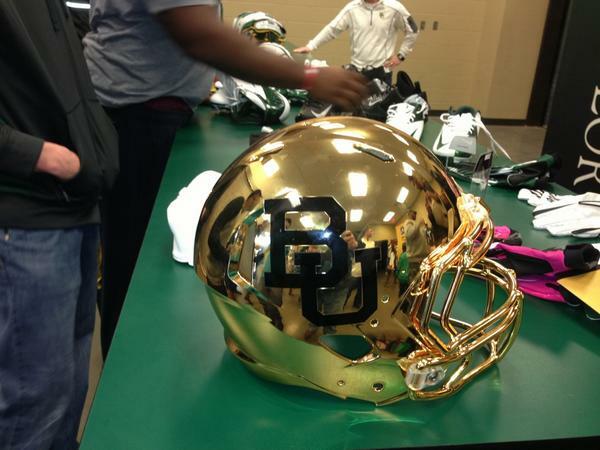 Via the miracle science of Twitter comes this image of Baylor's contribution to the ongoing deterioration of your retinas. Yes, it's yet another shiny chrome helmet all set to burn what's left of your corneas. All these chrome helmets popping up all over the place are beginning to look like some sort of conspiracy dreamed up by the American Optometric Association to keep its members in business. From the "stupid things coaches do for charity" dept. comes Ohio head football coach Frank Solich participating in a tricycle race for Central Ohio Heart Walk. Solich is the one in the white t-shirt. Say, you know what this tricycle race needs? A monkey-eating bear, that's what. Now that would rake in the bucks. What's a new college football season without a some gratuitous tweaking of uniforms? The latest team to do so is Tennessee, whom will be ushering in the era of new Vols' head football coach Butch Jones with some subtle changes to those ever-popular frosted orange and white unis. The scariest change to the unis? The orange numbers on the road jerseys will have an "checkerboard background." "The Vols will wear a state of Tennessee patch above players’ names on both the home and road jerseys, Jones confirmed to the News Sentinel on Monday. Tennessee will also add a checkerboard background to the orange numbers on road uniforms. Jones said the changes, first reported Monday by Volquest.com, would be minor and subtle and would reinforce his statewide message." Be afraid, Vols fans. This could end up being either very interesting of very scary. Especially since this is the work of Adidas and not Nike or Under Armour. Covering Dixie Like Mildew: Johnny Manziel, Antonio Morrison, recruiting, and more. That Joke Isn't Funny Anymore. Giving credit where credit's due. Covering Dixie: Antonio Morrison, Johnny Manziel, and more. 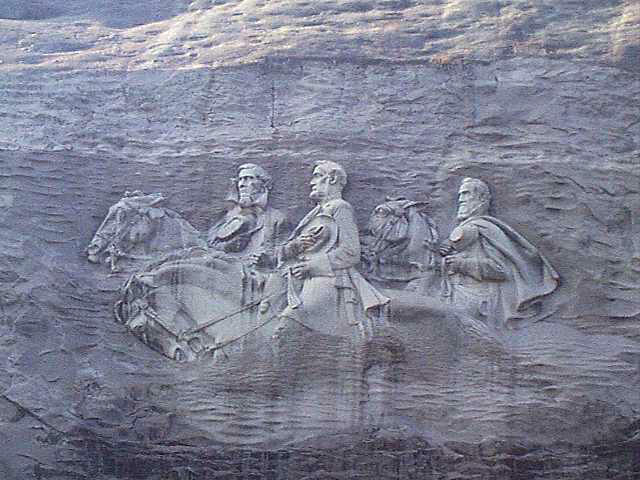 Alternate history in a parallel universe of the day. Good Bull Hunting looks at what it would have been like if social media was around at the time when 1957 Texas A&M Heisman Trophy winning halfback John David Crow was a senior in College Station. You can figure out where this one is going. Ohio State WR Carlos Hyde "person of interest" in assault case, reportedly dismissed from football program. Ohio State head football coach Urban Meyer has reportedly been dismissed Carlos Hyde from the team Buckeye football program. This come after the running back was named as a "person of interest" in an incident involving "a weekend assault against a female in a Downtown bar," according to The Columbus Dispatch. "Hyde, who came within 30 yards of becoming the first running back to rush for 1,000 or more in the 11-year coaching career of Meyer, had been projected to have a stellar senior season. But he was named a person of interest in an incident that according to the police report occurred about 1:54 a.m. Saturday at the Sugar Bar 2 on S. Front Street." The Dispatch also reports that Meyer is looking into a situation involving starting cornerback Bradley Roby, who is " facing preliminary charges of battery resulting in bodily injury," following an incident at a Bloomington, Ind. bar. SEC coaches head to Bristol for the ESPN "Car Wash."
The SEC's head football coaches will be making the rounds at the Briston, CT headquarters of ESPN for the next couple of days as they go through the WWL's "Car Wash" of its sundry TV and radio programs. The coaches will promote their teams as they go through the rigors of having to deal with the likes of Colin Cowherd and Skip Bayless. Tuesday puts the focus primarily on the newest members of the SEC coaching fraternity, along with Florida HC Will Muschamp and South Carolina HC Steve Spurrier. The fun starts at 11:00 AM on both days. Florida player arrested for barking at police dog. They said it couldn't be done, but Florida linebacker Antonio Morrison may have just invented a new way of getting arrested. Morrison was arrested Sunday morning for allegedly harassing a police dog while barking at it. Yes, that is actually a crime. At least it is when the police officer paired with the dog is in the middle of handling an incident. "Morrison, a 19-year-old sophomore, was arrested early Sunday morning after Gainesville police said that he was a bystander at an incident outside a downtown bar. He began barking at and harassing a police dog, according to a police report. Morrison has been formally charged with " interfering with a police animal and resisting arrest without violence." Both are second-degree misdemeanor. He had recently been arrested last month after allegedly assaulting a bouncer. The Fallout: Johnny Manziel, Nick Saban and Bret Bielema, C.J. Mosley, and more. The Thing That Won't Go Away. Deadspin claims that Johnny Manziel might not have been honest about the events that led to his early departure from the Manning Passing Academy camp. Color we shocked. Austin Roberts: International Man of Mystery. The Fallout: Johnny Manziel, A.J. McCarron, LSU and more. Act your age, mama, not your shoe size. If I die before I wake, feed Jake. Texas A&M blog Just Wait Til Next Season isn't buying Alabama starting QB A.J. McCarron's "po' boy" act, pointing out his chest tattoo and his SUV complete with vanity plates. I'm just a Purifoy. I need no sympathy. Mr. Jones and me tell each other fairy tales. The baddest of the bad (and not in a good way)? Jordan Esco wonders if Oklahoma's 2013 home schedule is the Sooners' worst home schedule of the century. The past week-and-a-half or so of Texas A&M starting quarterback Johnny Manziel's life may not have been his finest, but let's admit it: Getting kicking out of leaving the Manning Passing Academy by "mutual agreement" is still better than what your mowing the lawn last weekend. Still, Manziel's week got a little better once he left the spotlight of SEC Media Days and headed out to Los Angeles for the spotlight of the ESPY Awards. Manziel was accompanied his coach Kevin Sumlin, his sister Meri Manziel, and a film crew from Texas A&M's 12th Man TV. Manziel also got to hang out with former teammates Luke Joeckel and Ryan Swope, as well as Best Moment winner Jack Hoffman. He also picked up the Best Male College Athlete ESPY. Steve Spurrier in the most Steve Spurrier photo ever. Why is this photo of South Carolina head football coach in an unidentified fast food restaurant (best guess: Arby's) here? For one thing, the photographer was South Carolina defensive end Jadevon Clowney who took this photo of his coach and posted it on Instagram. For another thing, this might be the most Steve Spurrier photo ever, with the Old Ball Coach appearing with an undone tie, sunglasses, and giving the thumbs up. The other reason why this photo is here? 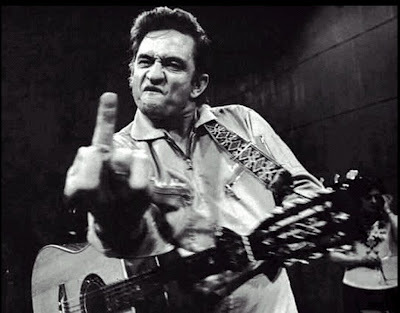 Because it reminds me of this classic Johnny Cash photo where the Man in Black flashes the camera an entirely different finger gesture. You get the feeling that Spurrier and Cash are relaying the same message, for some reason. Covering Dixie: Johnny Manziel, Bret Bielema, and more. A script "Brohio" tank top for all you Ohio bros out there. What happens when an dubious meme from a former New York Yankee-turned-Cleveland Indian meets one of college football's greatest and most cherished traditions? A capitalist trying to make a buck, that's what. Bromerica has come out with this "Script Brohio" tank top, apparently in response to the meme created/exploited by Cleveland outfielder Nick Swisher. Naturally, someone but two and two together and came up with a play on the Ohio State Marching Band's legendary "Script Ohio" marching formation. fThere's a regular t-shirt style available as well, in case the wife-beater is too "brah" for you. Covering Dixie: Johnny Manziel, Jadevon Clowney, Steve Spurrier, and more fun at SEC Media Days. Never a loss for words. Paul Finebaum at SEC Media Days. For Whom the Cowbell Tolls tries to predict where SEC HC's will eat at SEC Media Days. Safest bet: Mark Richt goes to a Chick-fil-A. Today is the most overrated day in Johnny Manziel's life. Texas A&M starting quarterback Johnny Manziel is supposed to speak to the media today at SEC Media days. The press conference has quickly done the impossible in overshadowing the rest of SEC Media days. It's expected that Manziel will be grilled over his early departure from the Manning Passing Academy camp over the weekend, his pleading guilty a charge related to the 2012 fight that first garnered him national attention, and everything not related anything he has or will do on the field. The press conference certainly couldn't come at a worse point in Manziel's brief college football career. The media has piled on him like piranhas going into a feeding frenzy over a hamburger, which in itself has been garnering criticism for its alternating levels of self righteousness and hypocrisy. If you're expecting fireworks today though, don't. 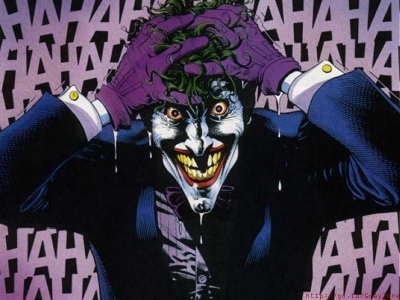 Manziel may admit to "reckless behavior" at the Manning Academy (which he might as well, as there are photos on the web of his Friday night before he left camp), but don't expect him to either cry at the podium or explode in a rage of frustration. Don't expect this to be a defining moment in Johnny Manziel's life. Most of those are going to happen on the field. If anything, this will be a blip on the landscape of Manziel's life. Champaign, Il, Walmart salutes Illinois with display made of soft drink cartons. Cardboard soft drink cartons have become the LEGO blocks of retail America. 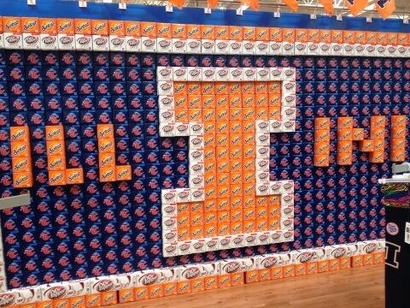 This display honoring the Illinois Fighting Illini comes to us from a Walmart Champaign, Il. Well, you didn't think it was going to be in Evanston, did you? For the record, the soft drink cartons used in this display are apparently Diet Dr. Pepper, RC Cola, and Sunkist. They also happen to be the only three soft drinks served in Hell. Big Tentacles: Brady Hoke, Northwestern, Purdue, and more. Off Tackle Empire's Michigan week continues with a look at Wolverine head football coach Brady Hoke and his coaching staff. Illinois player profile of the day. A Lion Eye profiles Illinois wide receiver Peter Bonahoom. Purdue player profile of the day. Hammer and Rails profiles Purdue LB Ruben Ibarra. The Crimson Quarry ponders which Big Ten coach would win a Hunger Games style tournament. Apparently the author of The Hunger Games was an Indiana alumni. Eleven Warriors ranks"the state gemstones/rocks of the Big Ten. Since 11W is an Ohio State blog, you can figure out which state's rock comes out on top. Covering Dixie: Johnny Manziel, SEC Media Days, A.J. McCarron, and more. I had the opinion it was out of control. Arkansas Expats discusses how first-year Arkansas head football coach Bret Bielema can win over the crowd at SEC Media Days. Peter King has some things to say about the latest Manziel controversy, which Kissing Suzy Kolber trashed him over in its regular trashing of all things Peter King. This is for the questions that don't have any answers. Media frenzy over latest Johnny Manziel controversy reveals more about media than it does Manziel. A.J. 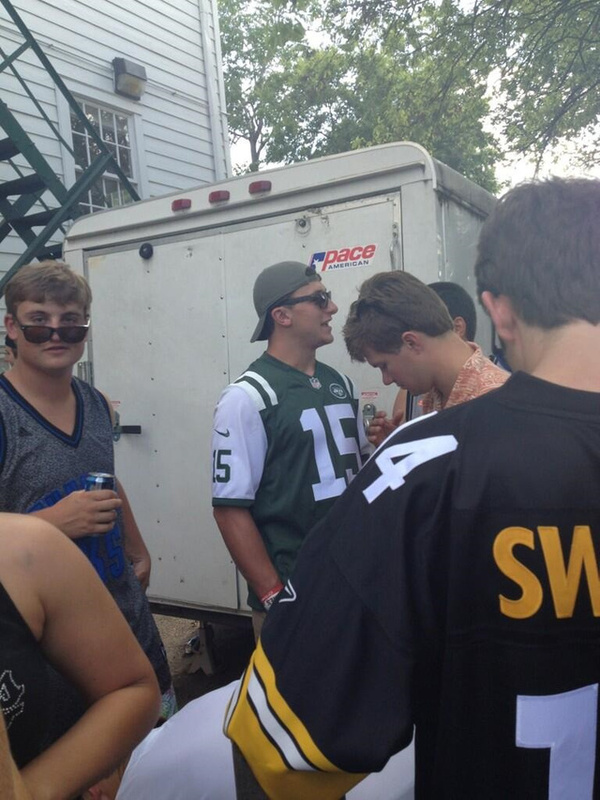 McCarron, Johnny Manziel, and some new friends. Photo via al.com. Texas A&M starting quarterback Johnny Manziel's sudden departure from the Manning Passing Academy football over the weekend has unleashed an well-expected media frenzy. The trouble is that in all the coverage very little has been revealed about whether or not Manziel's departure was due to illness (the official stiory) or yet another case of Johnny being Johnny. For example, The Victory Formation's criticism of ESPN reporter Chris Mortensen's coverage of the story had more to do with how the WWL failed to give proper credit to the original report of the dismissal story, Rumors and Rants, than it do to whether or not Mort got the facts right or not. "For starters, there weren’t internet reports. There was one report. Labeling it as if it was a message board fodder was inaccurate and irresponsible. Why would ESPN find it necessary to even report about Manziel being sick and going home? There isn’t a reason. The reason Mort investigated it and reported about it is because of Rumors and Rants report emerging that he was sent home by Archie Manning. Star players miss practices all the time, and this wasn’t even close to being important as an Aggies practice, except for the initial report said he was kicked out. Therefore, people like Mort and Mike Florio should have cited the story properly, but instead, they failed." Then there was the following tweet from ESPN analyst Mark May, who couldn't help to finger-wag at Manziel on Twitter. Alright Johnny Football enough is enough this is your last wake up call STOP BRINGING SHAME TO THE GAME ! 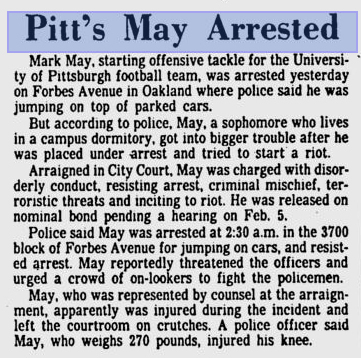 This led to Texas A&M blog Good Bull Hunting to drop the hammer on May by peeking into his legal run-ins when he was an offensive tackle at Pitt, and as a member of the Washington Redskins. Of course (as the Pearl Jam song goes) "This behavior's not unique, for either May or the internet. It's another case of a media personality giving his uncalled for two cents, and a pro-school internet site responding in full. Then SEC media gadfly-in-exile Paul Finebaum had to weigh into the Manziel fray. Finebaum already made waves accusing Manziel of having "a train wreck of an offseason." He's now doubled down and compared Manziel to a certain recent pop culture sensation. "I feel like it's Thursday night again and I'm watching Sharknado," he said on SportsCenter. "You can't take your eyes off the screen. It's a train wreck, but it is very compelling, and it's also very disturbing for many reasons." PAWL's obligatory reaction isn't even an original one since GIF-master CuppyCup had already made the Manziel-Sharknado connection. While this has been going on, there has been little attempt by traditional media sources to find out the full details surrounding Manziel's departure from the Manning camp. It's been left up to sites like Deadspin to detail Manziel's alleged hangover-causing partying on the Friday night before the departure with Alabama QB A.J. McCarron. Or whether or not Peyton and Eli Manning may have been partying with Manziel and McCarron, as suggested in photos posted online by Busted Coverage. In the end, the coverage of the latest Manziel controversy has been more revealing about the media than it has about the incident itself. Which isn't shocking in the least bit.